Currently viewing the category: "Apart Radio"
Stream or download episode 015 of the Apart Radio podcast featuring a mix by Theodore Elektrk. Hosted by Fortune and produced by Jason Allen. Recorded December 2015. Stream or download episode 009 of the Apart Radio podcast featuring a pre-recorded house / techno set by Denver's Paul Anthony. 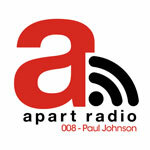 Stream or download episode 008 of Apart Radio featuring a live recorded mix by Chicago's Paul Johnson. Hosted by Fortune, produced by Jason Allen. Recorded April 2014. Stream or download episode 007 of Apart Radio featuring a live recorded mix by Minneapolis's Centrific. Hosted and produced by Jason Allen. Recorded January 2014. Stream or download episode 006 of Apart Radio featuring a pre recorded mix by Milwaukee's Niki Kitz. Hosted by Fortune, produced by Jason Allen. Recorded February 2014. Stream or download episode 005 of Apart Radio featuring a live recorded mix by Madison's Nick Nice. Hosted and produced by Jason Allen. Recorded August 2013. Stream or download episode 004 of Apart Radio featuring a pre recorded mix by New York's The Juan Maclean. Hosted by Fortune, produced by Jason Allen. Recorded September 2013. Stream or download episode 003 of Apart Radio featuring a live recorded mix by Milwaukee's Jason Allen. Hosted by Fortune, produced by Jason Allen. Recorded April 2013. Stream or download episode 002 of Apart Radio featuring a live recorded mix by LA's DJ Hyperactive. Hosted and produced by Jason Allen. Recorded February 2013. Stream or download episode 001 of Apart Radio featuring a live recorded mix by Milwaukee's Dela and Screendoor. Hosted by Fortune, produced by Jason Allen. Recorded November 2012.